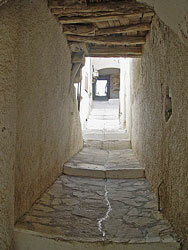 The town of Naxos is built over the remains of the ancient town of Kallipolis. On the hill of the medieval castle, whose highest points were flattened by the Frankish establishment, was the ancient citadel. The town was built on the northern side of the hill towards the beach at Grota. A large part of the ancient city is today covered by the sea, as the level of the Aegean has risen since the ancient times. At the sea floor the remains of ancient buildings can still be seen. The centre and the market place of the ancient town stood where the Orthodox Cathedral is today. Under Metropolis square (the archaeological place of Grota), excavations have revealed remains of the ancient town of Naxos dating to the 1600 BC, one of the most important settlements in the Aegean. The area has been turned into an archaeological park and is open to the public. According to an old manuscript, the Temple of Poseidonas was built on the small island inside the mouth of the harbor, where the church of Mirtidiotissa is today.